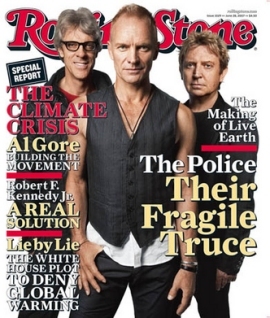 The new issue of Rolling Stone hits the news stands today (June 13) and features an in-depth interview with The Police conducted by David Fricke. There’s also a nice little behind the scenes video over at RollingStone.com, which was shot by Jordan Copeland, Stewart Copeland’s son. The Police will be headlining the Bonnaroo Music and Arts Festival on Saturday, June 16th and then continuing to tour around the world after that. Look for live streaming webcasts of Bonnaroo over at the AT&T blueroom from June 14 – June 17.